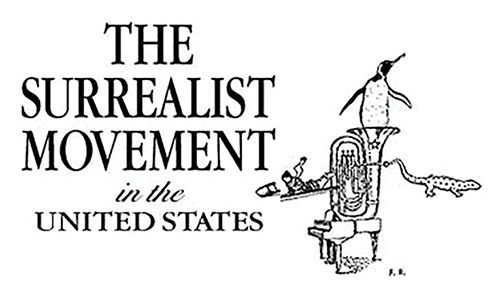 This page hosts an archive of the original Surrealist Movement in the United States web site. Click on a link to download a PDF for that page. PDF with all the information from the site. The text below is from the home page of original site. Books referenced may be found at the Charles H. Kerr Company. Interested in what surrealism is and does? Then you'll find this website essential. The Surrealist Movement in the United States includes the Chicago Surrealist Group and its many participants scattered from coast to coast. Formed in the summer of 1966 with the encouragement of André Breton and the Surrealist Group in Paris, as well as the surrealists of many other countries, the Chicago Surrealist Group has carried on its wide-ranging research and agitation uninterruptedly ever since; the group has long been recognized as one of the most active, innovative and prolific in the international surrealist movement. As the Chicago-based group attracted more and more collaborators from other cities, its publications increasingly appeared under the name Surrealist Movement in the U.S. Radically different from other websites "about" surrealism—the great majority of which contain nothing but misinformation—this site is the voice of the Surrealist Movement itself. For a summary of the Surrealist Movement's perspectives today, see the Introduction ("Surrealism: The Chicago Idea") to The Forecast Is Hot! Tracts & Other Collective Declarations of the Surrealist Movement in the United States, 1966-1976 (Black Swan Press, 1997). This collection of ninety-seven documents from the first ten years of U.S. Surrealism, is edited by Franklin Rosemont, Penelope Rosemont and Paul Garon. Surrealism: Revolution Against Whiteness, the first detailed examination of surrealism's race politics, from 1924 on, focuses on the movement's fundamentally anti-Eurocentric outlook, its multiracial composition, and its many and growing contributions to the struggle against white supremacy. A special issue of the journal Race Traitor (Guest Editor: Franklin Rosemont), it includes contributions by fifteen participants in the Surrealist Movement in the U.S., as well as several texts from abroad. Surrealist Women: An International Anthology, edited with introductions by Penelope Rosemont, is the first book in any language of writings by the many women who have taken part in organized surrealism from its origins to today. With over 300 selections by 97 women, this breakthrough collection is in fact the largest anthology devoted to surrealism ever published in English. (University of Texas Press, 1998). Paul Garon's Blues and the Poetic Spirit (revised, expanded edition, City Lights Books, 1997), is a unique inquiry into blues and the mind, the blues as thought. A classic of blues literature, Blues and the Poetic Spirit uncovers the revolutionary and revelatory potential within the blues and the creative sources from which it springs. Woman with Guitar: Memphis Minnie's Blues by Paul Garon and Beth Garon (Da Capo, 1992), is a biography of this exceptional blueswoman: oral history and an analysis of her songs based in feminist theory, psychoanalysis, and Black studies. Surrealist Experiences:1001 Dawns, 221 Midnights by Penelope Rosemont (Black Swan Press, 2000) focuses on fortuitous encounters, including the author's adventures in the magnetic fields of "pure psychic automatism." The book collects articles and essays by Rosemont from surrealist journals throughout the world, plus several published now for the first time. Among the many illustrations are examples of her own automatistic discoveries: the Alchemigram, Landscapade and Prehensilhouette. "Poetry of the Future" offers a sampling of poems—and statements on poetry—by participants in the Surrealist Movement. This feature of our website will change frequently as we introduce new poems and new poets. "Images of Desire" reveals new surrealist work in the realm of painting, drawing, collage, photography and other "visual arts." Every three months it will feature the work of a particular individual active in the Surrealist Movement. Our inaugural exhibit focuses on the collages of Jan Hathaway. "Surrealist Games" highlights collective play as a major form of surrealist research. Currently featured is the game Time-Travelers' Potlatch. In "The Surrealist Review of Books" participants in the Surrealist Movement comment on new or recent books and pamphlets of interest from the surrealist point of view. Similarly, "The Surrealist Review of Periodicals" examines current journals, magazines, newspapers and zines. In the not-too-distant future we shall also begin a critical survey of other websites concerning surrealism. Black Swan Press/Surrealist Editions: A complete list of currently available publications of the Surrealist Movement in the U.S., plus a selection of Surrealist and other books of revolutionary importance published by other publishers but also available from Black Swan. Translators (especially of Czech, French, Greek, Japanese, Serbian, Spanish, Portuguese and Romanian) are needed for various surrealist book-projects. These projects are labors of love, involving no payment. what contribution(s) you believe you can make to surrealist revolution today.